Everyone has a story. 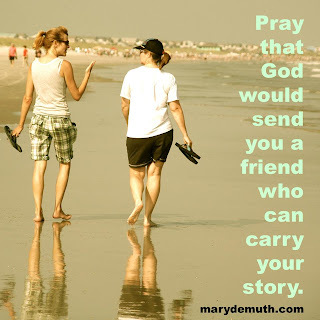 Our stories should never be dismissed, but unfortunately everyone we share our story with can't "carry" it. Not everyone can handle hearing someone's story, much less helping them do something in response. Sometimes it's because they can't wrap their brain around it, and other times, they simply don't want to try to understand. All of our stories deserve to be heard, validated and a caring response given to respond in whatever way appropriate to bring hope and healing. Sometimes we share our story with those who dismiss, or possibly even try to refute. That hurts much worse and results in giving us yet more to the story that we must carry and hope we'll find someone to help us bear the load. One thing I want to encourage anyone reading this to do, is...keep going. If you shared your story and someone dismissed it, questioned it, or attempted to invalidate it, DON'T GIVE UP. Keep going until you find someone who WILL listen. And when you find those kind of friends, you will never, ever be the same. Special thanks today, to all the friends who have been able to carry my story. I'm blessed to have more than one. How incredible is that?